How Much Cinnamon Do I Need to Take Lower My Cholesterol Levels? The spice cinnamon purportedly lowers cholesterol levels when consumed in large amounts. Cinnamon is also touted as a treatment for other health issues such as diabetes, diarrhea and even the common cold. Medline indicates that there's no solid science supporting cinnamon's effectiveness for anything. Mayo Clinic cardiologist Thomas Behrenbeck indicates that the amount of cinnamon you should take to lower cholesterol levels is none. Talk to your doctor before you self-treat with a complementary or alternative therapies. Cinnamon is native to Southeast Asia; the bark's essential oil and the bark itself are used to flavor and spice foods. Cinnamon got a buzz as a cholesterol-reducing agent after a small clinical study conducted in Pakistan was published in the December 2003 issue of "Diabetes Care." The study examined the effects of cinnamon on 60 people with type 2 diabetes. Researchers gave the control group 1, 3 or 6 g cinnamon a day for 40 days. At the end of the study, the control group exhibited reduced mean fasting serum glucose, triglyceride, low-density lipoprotein cholesterol and total cholesterol. There were no changes noted in the group of participants who were given a placebo. Some people take a large amount of cinnamon with an eye to controlling their cholesterol levels — between 1 g and 6 g., says Behrenbeck, which is the amount used in the study. He goes on to state that while cinnamon may affect how your body metabolizes sugar and fat, there's still no conclusive evidence that cinnamon works for high cholesterol. The study conducted on cinnamon focused on its effects on people with diabetes — not specifically those with high cholesterol. Researcher Richard Anderson of the Beltsville Human Nutrition Research Center in Maryland participated in the Pakistan study and indicated that cinnamon can be toxic in high amounts. Cinnamon may not be the answer to your cholesterol problems, but MayoClinic.com suggests other foods that are beneficial. Add high-fiber foods such as oatmeal and oat bran to your breakfast. Fish rich in omega-3 fatty acids are helpful; eat these at least twice a week. Choose from salmon, halibut, albacore tuna, herring, sardines, mackerel or freshwater trout. One-and-a-half oz. of walnuts or almonds can also help lower your cholesterol due to these nuts' heart-healthy unsaturated fats. Use extra-virgin olive oil in lieu of butter or margarine. Treat yourself to juices and yogurt drinks with added plant sterols or stanols. 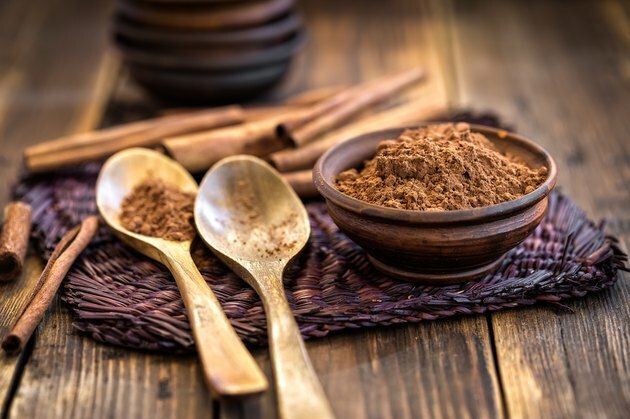 MedlinePlus indicates that cinnamon can interact with numerous medications, including diabetes drugs and hepatotoxic drugs, medications that may harm the liver. Taking large amounts of cinnamon can be particularly risky for people with existing liver disease. Behrenbeck suggests using cinnamon as a healthy flavoring for your food in lieu of sugar or salt. Talk to your treating physician if you have questions about cinnamon and your cholesterol levels. If you have high cholesterol, your doctor may recommend that you take specific medications. How Many Calories Does Cinnamon Have? Can Cinnamon Help You Lose Belly Fat? Can Honey and Cinnamon Help With Weight Loss? Can Cinnamon Help You Lose Weight?